Hortus Camdenensis | Begonia geraniifolia Hook. 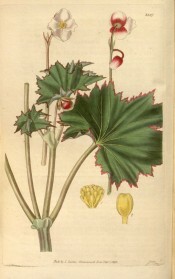 Tuberous-rooted begonia with fleshy, purple-tinted stems, roundish, serrated to lobed, red-edged, green leaves and clusters of pinkish-white flowers. [Krempin]. ‘Numerous as are the species of Begonia in Brazil, they appear to be rare, in similar latitudes on the opposite side of the vast continent of South America: and only seems to be recorded as a native of Peru, B. octopetala, L’Herit., which we have received from Mr. Mathews. The present was discovered in the neighbourhood of Lima, and roots brought to the Glasgow Botanic Garden by Mr. M’Lean, in 1833. In September of the following year, they produced their exceedingly pretty and very delicate red and white flowers, which contrasted well with the glossy and deep green foliage. It is to be regretted that only male flowers have yet to be produced, I am therefore unable to characterize the form of the fruit or germen’ [BM t.3387/1835].